Experience BIC Quality. Known World-Wide. 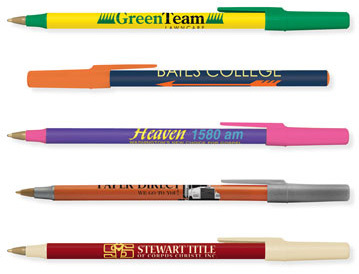 Imprint area for this pen: 2.5" x 3/4"
These take 6 business days in production, plus 2-5 day shipping time. Quantity 500 - ($195.00) .39 ea. Quantity 1000 - ($360.00) .36 ea. Quantity 2500 - ($875.00) .35 ea. Quantity 5000 - ($1700.00) .34 ea. Quantity 10,000 - ($3300.00) .33 ea. Florida & California residents pay sales tax.